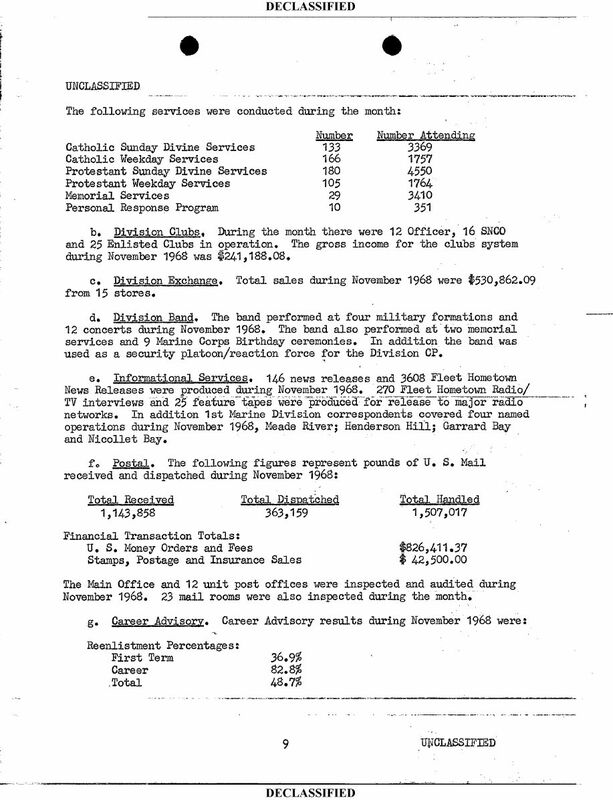 17,046 pages of 1st Marine Division Command Chronologies, dating from January 1966 to April 1971. The 7th Marine Regiment of the 1st Marine Division saw the first major ground action performed by American troops in Vietnam in 1965. Throughout the Vietnam War, the division's units participated in both multi-battalion size battles, and small-unit, anti-guerrilla operations. 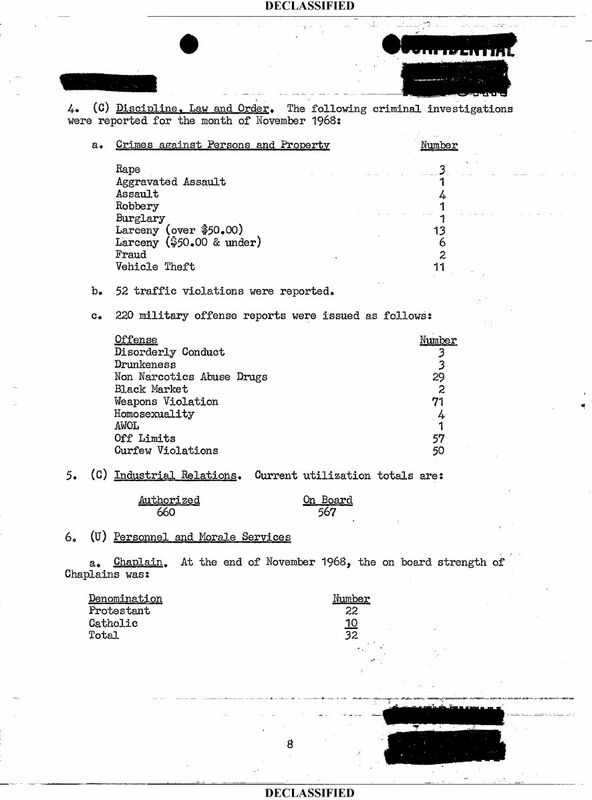 It conducted more than 160 named operations and thousands of small-unit actions while deployed during the Vietnam War. Battles and operations for the 1st Marine Division included Hastings, Hue City, Napoleon-Saline II, Oklahoma Hills, Pipestone Canyon, Imperial Lake, Chu Lai, Da Nang, Dong Ha, Qui Nhon, Phu Bai, Quang Tri, and Operation New Arrivals. 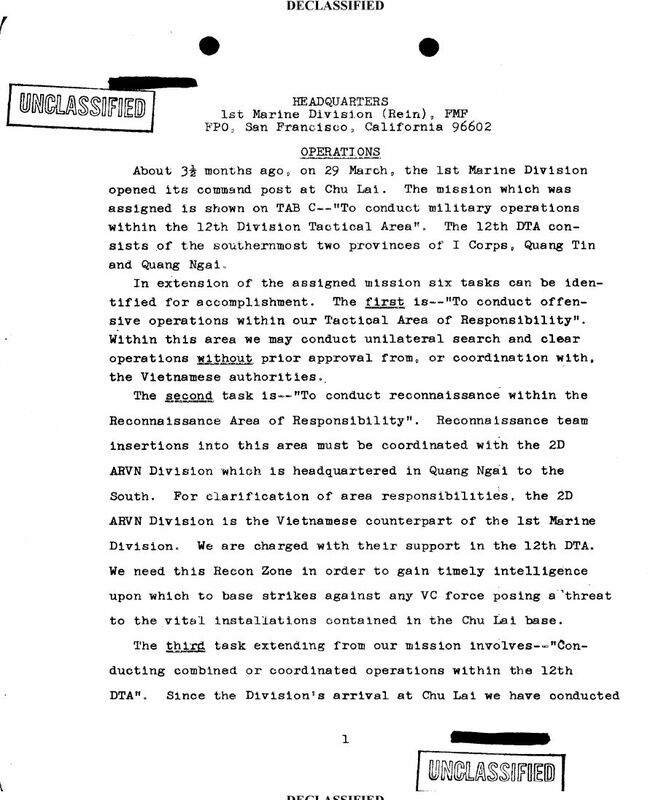 During the 1968 Tet Offensive, the Division was involved in fierce fighting with both Viet Cong and North Vietnamese Army elements. It successfully defended every enemy assault in its area of operations, pursuing its adversaries back to their strongholds. It was during this period that the Division earned its seventh and eighth Presidential Unit Citations. After six years, 1st Marine Division returned to California in 1971. In 1975, the Division supported the evacuation of Saigon by providing food and temporary shelter at Camp Pendleton for Vietnamese refugees as they arrived in the United States. 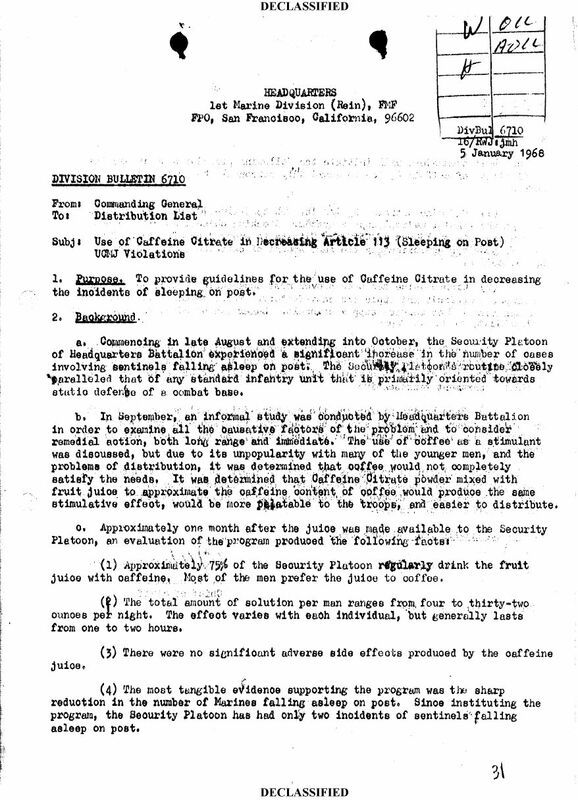 The Commandant of the Marine Corps General Wallace M. Greene, Jr., in July 1965 enacted Order 5750.2 (MCO 5750.2), which established the reporting requirements for command chronologies. 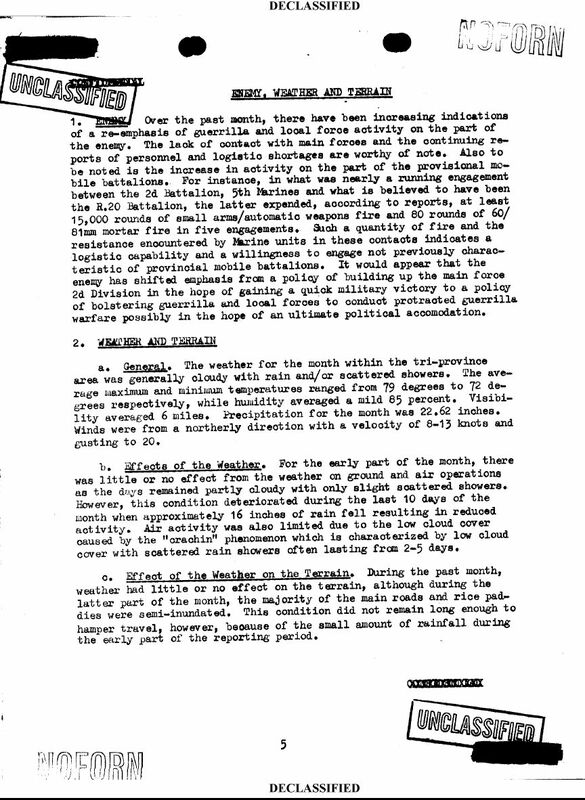 The order defined a command chronology as "a documented report to the Commandant of the Marine Corps of the significant events of designated Marine Corps organizations," providing "a periodic summation of its experiences useful in future planning and orientation of new personnel." The order called for the Command Chronology to provide a concise review of the highlights in the experiences of the command considered to be of special significance to the higher authority of the Marine Corps as a whole. Most of these chronologies include common sections of information: organizational data, narrative summaries of events, accomplishments and losses, sequential listings of significant events, and supporting documentation. 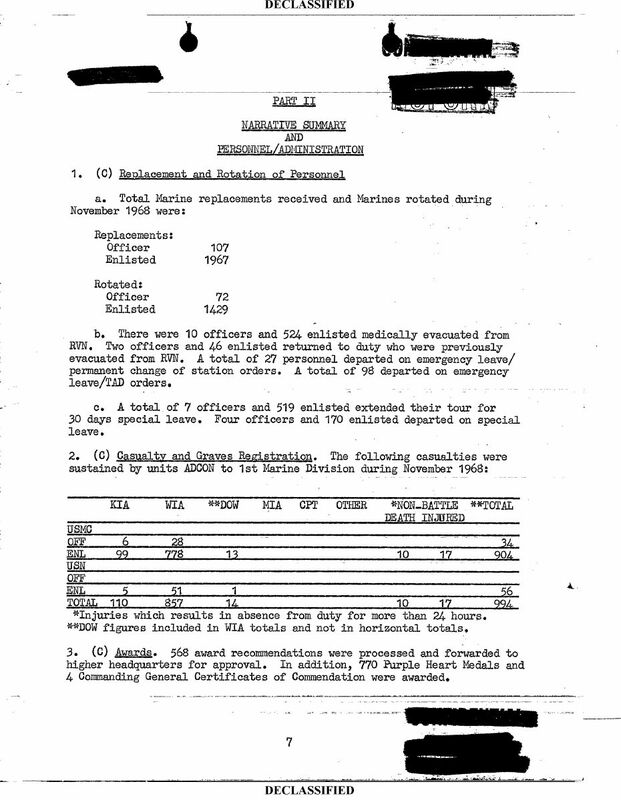 More extensive chronologies include lists of commanders, lists of staff officers, lists of locations stationed, lists of awards and training received, lists of operations participated in, situation reports, and records relating to community relations activities. The chronologies often include other documentation as attachments, such as supplementary reports, memorandums, maps, charts, photographs, newspaper clippings and bulletins. 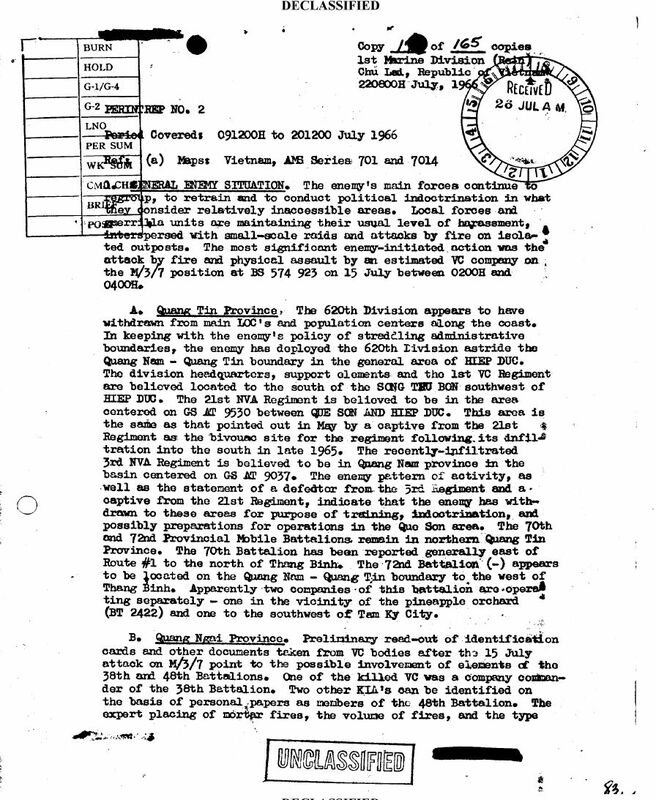 In the summer of 1965, with the intensification of the American involvement in the war in Vietnam, the Regiment was ordered to continental Southeast Asia. Elements of the Regiment began arriving in the Republic of Vietnam in August. During 1965, 1st Marine Division units participated in Operations Starlite and Piranha, the first significant engagements for American ground troops. Those units not deployed in the combat zone were staged on Okinawa. The first major operation in the war for a battalion of the 1st Marines was Harvest Moon in December 1965. In March 1966, 1st Marine Division Headquarters was moved from Okinawa and re-established at Chu Lai, over the next three months the entire Division was deployed to South Vietnam. The zone of operation for the Division included the southern two provinces of I Corps, Quang Tin and Quang Ngai. 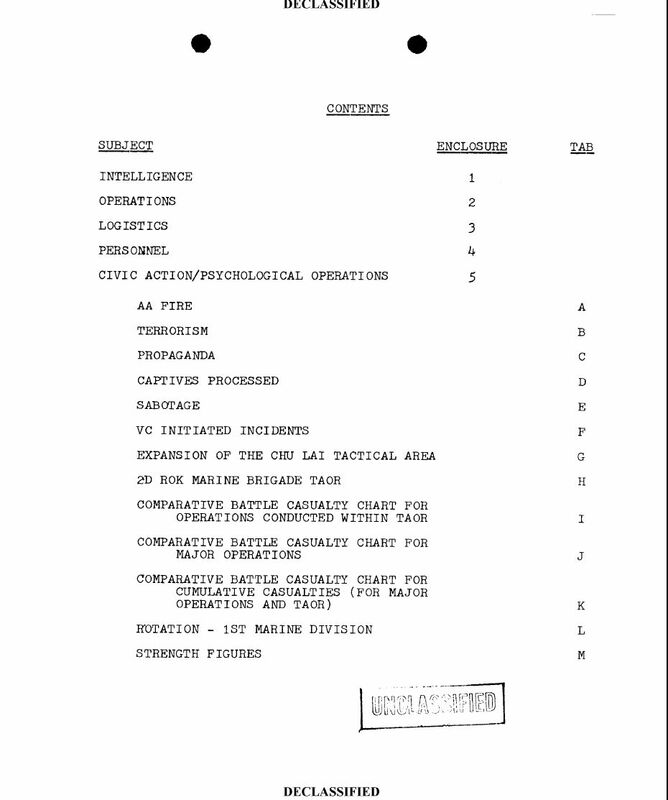 Between March 1966 and May 1967, the Division conducted 44 named and unnamed operations. In the succeeding months, the Regiment's battalions participated in operations Utah, Iowa, Cheyenne I and II, Double Eagle and Union I and II. Operation Hastings in July 1966 witnessed the most ferocious fighting of the war up to that time. By fall of 1967, the 1st Marines were operating permanently in the northern sector of the I Corps tactical zone. The following winter, the Communist and Northern forces launched their all-out Tet Offensive. They overran Hue, the old imperial capital. 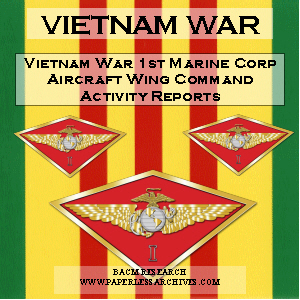 Between 31 January and 2 March 1968, elements of the 1st Marines, along with other U.S. Marine and South Vietnamese units, fought to regain control of the city. Bitter street fighting and hand-to-hand combat characterized the battle. Hue was finally recaptured after the opposition suffered nearly 1,900 killed. Heavy fighting continued for the Regiment through the rest of the year. Other major operations in 1968 in which the 1st Marine Division played a significant role included Allen Brook, and Mameluke Thrust. Action in 1968 culminated with Operation Meade River, which netted nearly 850 opponents killed. The Regiment remained deployed in South Vietnam for the next two and a half years, participating in numerous operations large and small. 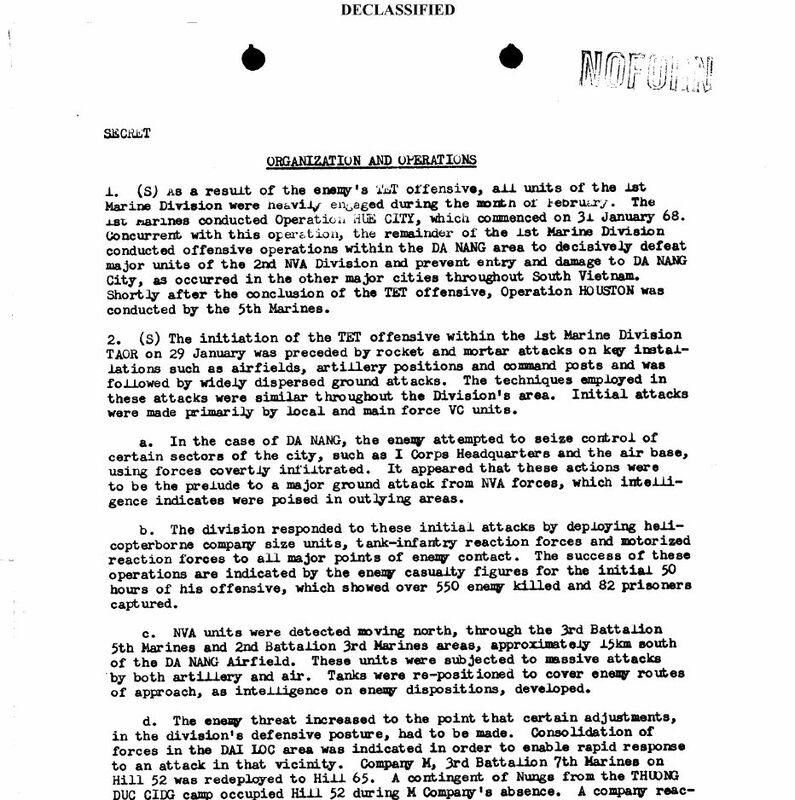 During 1969, the division continued to take part in combat operations, as evidenced by the heavy fighting which took place in Operations Taylor Common and Oklahoma Hills. During 1970, the 1st Marine Division began to withdraw its regiments from Vietnam. From late 1969 through early 1971, the 1st Marine Division was the only Marine division operating in the Republic of Vietnam, as a process of "Vietnamization" turned over more responsibility to the South Vietnamese. In 1971, the Regiment was ordered back to the United States, to Camp Pendleton in California. The 1st Marines were the last Marine infantry unit to depart Vietnam. In the spring of 1975, the 1st Marines provided primary support to the Marine Corps Base at Camp Pendleton for preparation of a camp to house Vietnamese refugees during Operation New Arrivals.